Saturday April 27. National annual Dachau commemmoration. 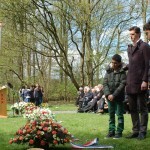 This was the first time that I had the opportunity to attend this event at the Dachau monument in Amsterdam. The date is always the Saturday closest to the 29 of April, which was the date the U.S. 7th Army Rainbow Division under General Patton liberated the Dachau concentration camp. Our mother and her companions were intercepted on May 1st, by the same American soldiers, on their death march from the Dachau satelite camp at München-Giesing. The last time that our mother attended this event there were still a good number of surviving survivors of the Dachau women. Today there was just one left, Mrs. Willemijn-Petroff van Gurp. 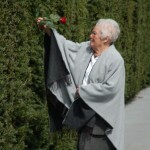 She is 94 years but in her condition she’ll be sticking her red rose in the Cypress hedges for another 10 years. I had a chance to talk to her. 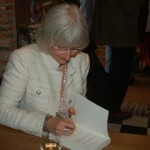 Two weeks ago she received my book “De Mastmakersdochters”. 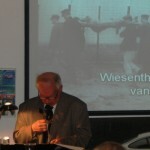 Several Dutch high schools have followed the lead taken in German high schools to write memoirs of Dachau survivors. The program is called “Names instead of Numbers”. See http://www.gedaechtnisbuch.de/namen-statt-nummern/english/index-engl.html Several of these students were in attendance. 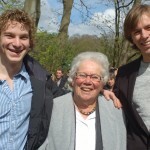 I show the photograph below of Willemijn and the Dutch teenagers Job Bruin en Jelle Braaksma of the Cartesius Lyceum who wrote her story. Willemijn was a school friend of Pom Koppert-Buma. (Remember: in Holland and most European countries married name-maiden name). I met Pom’s son, Sjoerd Koppert, in Santa Barbara in 1998 and he was on the dock in Santa Barbara to wave me out for the first long (3,000 nautical miles 28 day) passage to Hiva Oha in the Marquesas, exactly 8 years ago, this week. It looks ike I may have found a (cabin) roof over my head after all, in the “De Schinkel” marina. Stay tuned. I am staying temporarily with my sister and husband in Badhoevedorp. The festivities have started here already. Today is the crown-prince’s birthday. (And the 4th birthday of my princess Madison, my great-granddaughter.) His coronation is on Tuesday in Amsterdam. Elementary students accompanying the wreath for fallen Dachau prisoners. The deal was that I would stay here in Osdorp through April 30. Then I would use the boat of the young lady who moves in here on may 1st, but that offer was withdrawn. Today I found out that she wants me to get out by tomorrow instead iof Tuesday. So, I am in a mad scramble trying to find a roof over my head while working on the boat. Last night I came home from choir practice at 11 p.m. and did not fall asleep till about 3 a.m. and was up again at 6.30 Fortunately I had nearly 10 hours of sleep the nght before. The main reason I could not get to sleep that I was so angry with my Bank of America. I had waited 2 months to finally have a debit card again. Then I finally was able to order a Safe Pass which I need to transfer Dollars from my BofA a/c to my local a/c. But then I was told that my address had changed in the last 30 days and therefore could not get a Safe Pass. The I tried it once again and this time the BofA could not find any reason why I could not have a Safe Pass and they arranged to have it mailed to my daughter’s address in Virginia. But instead she gets a letter saying that I could not have a safe Pass. They gave a n number to call. I still have no idea why I used to be able use my Safe Pass, till the battery ran out, and now no longer. The only way is to have a code texted to a US cell phone. So, I got my daughter in on a 3 way conference call and she explained to Jeannine how to get the code on her cell phone and then I have to get the code from here and within 10 minutes, before the code expires make the wire transfer on line. Well that turned out to be an excercise in futility. There is no way that she can get me the code and for me to then do the arrangements within the 10 minutes. So, now, I have to delegate this entirely to Jeannine. Even when I tried to set up the address in the BofA online system of my US dollar a/c here, I needed the code. Why??? There must be thousands of Americans who spend a good deal of their life overseas and why can’t a bank the dimension of the BofA not come up with a better system, and why do I get a zillion different directions from their staff? Thank you for bearing with me on my ranting, now I will try get some sleep. The boat progress has slowed to a crawl, it is an enormously difficult job to remove the brittle cross grained teak, it just chips in short bits. I have half of it removed, took all week. There was moisture under the teak in a few places but no rot. 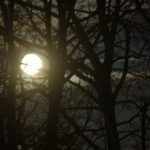 There is a gorgeous full moon tonight. The winter has skipped Spring into summer. You can see the grass grow, the trees flower. Sunday April 21st. A Frisian Invasion. The acquaintance with Gjalt was made through Bart Boosman. Bart came to look at an antique sports car Gjalt has for sale. So, this is an encore to the unusual way Bart and I met on the short wave radio in the middle of the Atlantic Ocean in July 2009. And it was through this encounter that I was given access to the memoirs of Bart’s grandmother, Tiny Boosman, who was a concentration camp companion of my mother. Gjalt and Jack ordered their copy of “De Mastmakersdochters” and Jack had already read part of it and said very kind words about my efforts. 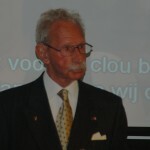 One of Jack Kooistra’s longtime friends, another Frisian, addressed the audience, retired Lieutenant General Ted Meines (92). An amazing personality, he did not need a microphone; and he gave a wonderful testimony of his Faith. He reminded me of my Frisian grandfather. Well, it looks like the removal of the Teak deck is going to be a much bigger job than I had hoped for. I had hoped that I could bust the teak from the rubber like Detco bedding/glue on top of the 3/8″ marine plywood. But the top and often the second veneer layer come up with the glue. This means that I will most likely have to replace all or the majority of the plywood. And then I discovered that the plywood has been nailed with bronze ring shank nails. And they are practically impossible to pull like a common smooth shank nail and because it is bronze it will then break and makes it even more time consuming to try and extract the remains. I was expecting to be able to pull the teak strips in long lengths but it is very brittle and breaks in tiny fragments and that takes for ever to remove. I hope my luck will turn on the 22nd. I promised in my previous blog that I would let you know about Maria Boonzaaijer’s book “Het vreemde meisje”. I finished reading it very late at night, last week. I just could not put it away. Another reader calls it a “page turner”. The main character, Irana, learns Dutch in Moscow so that she can search for her father in Holland. I recommend you all do the same, learn Dutch, so that you can read this book. Or twist my arm. This is Maria’s second publication, after “Papa Tango” which also is a very good story. But in this book she has made a leap into the pros. Irana is born out of an affair of a Dutch priest visiting Moscow. It is about real people and real places. The ones we have all known and places we have been. Love, deception. isolation, abuse but in the end triumph for the most part. Some passages are outright awesome. For me it was also an extra pleasure that the second main character, Irana’s aunt, grew up in my old neighborhood and her brother chose the priesthood in the Thomas van Aquino church, which is also mentioned in “The Mastmakers’ Daughters”. Not sure if I ever mentioned that the author, Maria, grew up two blocks from where I grew up. I met her and her husband Stephen on their boat in French Polynesia in 2005. 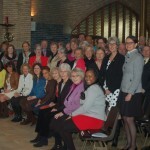 She used to attend the Thomas van Aquino church and had become Dutch Reformed. And I had done the opposite. So we keep the old neighborhood in proper balance. The work on the boat is progressing. Yesterday I removed the last of the two rub-rails. And after unscrewing hundreds of screws from the deck and removing all the hardware, the dirty job of removing the teak starts tomorrow. This afternoon I am invited to attend a book presentation in Oud Loosdrecht. 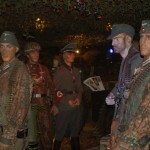 The book is a series written by Jack Kooistra about the Reprisals here in the Second World War. I am back at square one trying to find a roof over my head from May 1st. I thought I had place on a power boat in the “Schinkel” but that fell through. Thursday April 11. “Fleetwood” is on the hard. With my week’s house arrest curing my flue and the polar temperatures I had lost time to prepare “Fleetwood” ahead of the haul out. She moved into the shed, at Hans de Boer, on Monday morning. The plan was to remove the keel, so that I would not need to climb ladders as much for the extensive overhaul. But I could not budge the keel bolts. The underwater hull looks as when I launched a year ago on the island of Chios. But the lower part of the iron keel is going to need many hours of work. I hit a few rocks and got stuck on gravel a few times too often on the Rhone and the Saone. My finger tips are sore and cracked my body aches all over from removing the fasteners through the teak deck that needs to be removed. Twisting my winter over fed body into the nastiest crawl spaces. But I am in a good location to get this done. 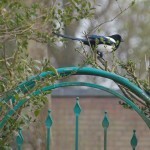 We have had our first frost free nights but I cannot wear enough warm clothes to keep from shivering. This weekend we are promised temperatures between 10 and 15 degrees Centigrade. My cold is still not entirely cured. Last night was choir rehearsal. We will have a general practice, with the other choir group, on Saturday for the May 4th performance. I absolved the Bank of America for their trespasses but they did it again. This time they are insisting that I have changed my address in the last thirty days and therefore I cannot request the stupid little “Safe Pass”, which I need to make wire transfers out of my BofA account to my Dutch account. I wonder what they will come up next after they finally agree that I have never changed my address. A never ending battle with people who apparently just read stock answers from a cue card and cannot use their tiny brains to understand what I need. When I asked to give me the new address, that I now supposedly have changed to from the only address I have ever given them, they were unable to give that to me. Off to the boat yard. Saturday/Sunday April 6th & 7th. Spring, maybe? It still drops below freezing at night. Saturday night it dropped as low as 10.7 Centigrade below freezing in one spot in Holland. That is 13 degrees Fahrenheit….But the sun came out And out of the breeze it has plenty strenght. I stopped to have coffee at Evelyn, after mass, and we could sit out in her garden, in the sun. 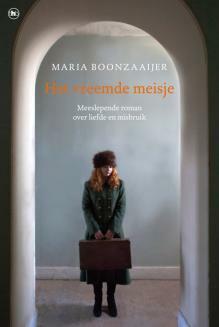 Yesterday afternoon I went to Haarlem to attend the launching of Maria Boonzaaijer’s new book: “Het Vreemde Meisje”. I met the Boonzaaijers in Papeete, Tahitiin 2005. And we have stayed in contact. It will be my entertainment after dinner after a hard day’s work on the boat. The boat goes into the shed Monday morning. I will let you know how I liked it. But I am quite certain, from what I already heard from the ones hwo had a preview, that this will be even better than “Papa Tango” her previous book, which I enjoyed very much. Friday April 5th. I have a bank card!! The third try was a charm. The FedEx envelope was delivered today. The BofA sent it out on Wednesday. They have been forgiven and back in my favor. Also in another phone call with the BofA today I found a way to wire money to my dollar account here without having to risk getting a new Safe Pass to end up in the same black hole that the previous two bank cards ended up in. My gut feeling is that they are in a desk drawer of some sleuth in the Dutch Custom/Immigration service. I just checked my passport and there is no evidence that I ever left Holland since I arrived here over a year ago. And that means that I am here illegally, beyond the 90 (I believe) day limit, without a residence permit. When I left here for the boat in Greece, in April 2012 I was never stamped out at the airport. And not stamped in at a number of border crossings. I visited Greece, Turkey, Albania, Montenegro, Croatia, Italy, Malta, France, Belgium and back into Holland. (Several of these countries twice) And the only stamps in my passport are Croatia and Montenegro… In many place there are no border posts. 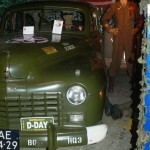 So, if my blogs go missing you might want to check with the Dutch Marechaussee. 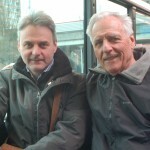 My nephew Jacob van Ommen, named after me, is visiting from Berlin. I last saw him in 2003. His partner, Maren, her son Tobias and his daughter Lara (the two will be both 16 this year) came also. They came on Wednesday and are flying back tomorrow. I showed them my (and his father’s) old neighborhood and explained some of the logistics around the address as to where his grandparents and neighbors were arrested back in April 1944. And the nearby address where Anne Frank had lived. Except for a few sad looking frozen crocuses there is little to show of what Holland usually looks like at this time of the year. The temperature remains just around freezing and a nasty cold wind discourages the tourists. I am starting to believe that our Eastern neighbors may have something to do with the weather. 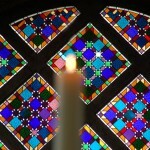 Orthodox Easter is not until May 5th., this year. 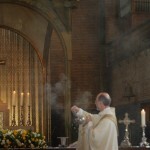 They have just started their 55 days of Lent on March 18. In the last few years our Easter celebrations have coincided and last year was just a week apart. Last year I celebrated Easter in Amsterdam and a week later in Greece once again. It snowed on my way to church. 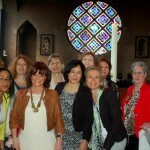 We had a wonderful celebration at Saint Augustin Church. 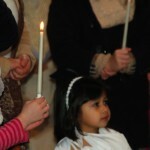 Two children and one adult received the sacrament of Baptism. 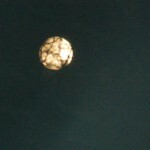 Below are a couple of pictures. I took more yesterday and I have put a slide show together of twenty pictures I took over the nearly 4 years that I attend this church at www.cometosea.us/albums/albums/Augustinus.wmv I will miss the church with it’s unusual architecture, the priest, father Ambro Bakker and his inspiring sermons and the choir when I leave here in June.